“no,” the speaker replied, “that’s not the point.” the truth this illustration teaches us is: if you don’t put the big rocks in first, you’ll never get them in at all. what then, are the ‘big rocks’ in your life? since becoming minimalist, we have been able to identify the big rocks in our lives — our kids, our friends, our faith, our goals, and our influence. 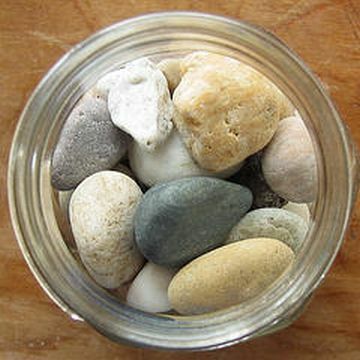 becoming minimalist is about identifying the big rocks, putting them in the jar, and intentionally eliminating the little rocks. Wow, powerful! Thanks for this. I’ve also sub’d to your RSS feed and look forward to reading. Have a great weekend! hmm, the way i heard this story is that the last thing to go in was beer and the moral of the story was “there’s always room for beer” but i admit i like this much better. and it’s a simple and brilliant idea we often forget. I believe this story is older than Covey, I think I’ve read a 18th century version with cannon balls, buckshot, sand and water. I can’t remember the moral of that story – it may have been about perception versus reality – but I like the moral of this story better. I have a small family, so I am really enjoying reading about your adventures with children. I love Covey! First things First is my most read book, together with Simple Abundance. Thanks for putting your thoughts to words so you can help us all. Oh, I read a great book recently called Simplicity and Success by Bruce Elkin. Its all about thinking about what you want to create in your mind and then creating it. So rather than purging your wardrobe because its bulging with stuff, you think about how you want it to look and create that. Much more positive way of looking at it I thought. Yes, make a list of what you do want and discard the rest. Ya when I tell that story, I use beer instead of water. I know, terrible. But I love the story.. and I think I may actually do the demonstration of this one day soon for my son. It’s a great visual representation of how to live, and make sure you don’t forget the important stuff.